From my third Voluspa haul, the first candle I picked to burn was the Saijo Persimmon. It was an instant favorite with me. Even before I burn it, the smell was already winning my nostrils. It had the most attractive scent among the Voluspa haul I purchase. Mind you there are 8 other scents in there but it attributed to the special candle lid design on this one. 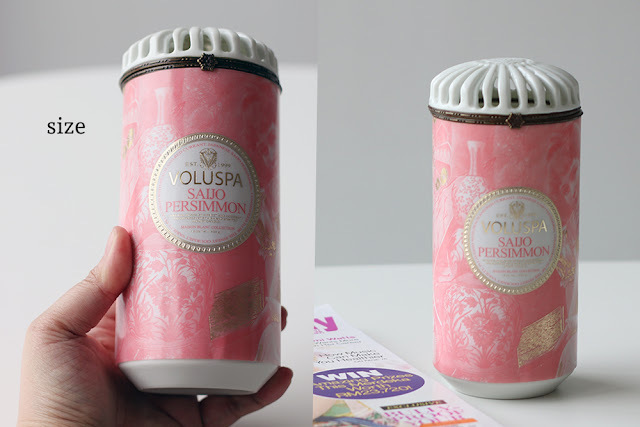 Called the Ceramica Alta candle or the Ceramic Pillar Scented Candle from Voluspa, it features a lovely ceramic bottle, heavy in weight, firm to the grip and it is big compared to the photographs shown that you would not expect how beautiful it would be until you received it. Modern yet traditional. The top lid also made of ceramic, is a vented snap close lid allowing the scent even when it's not burnt to disperse out. Doubling as "diffuser" home decoration piece. Only when you need to burn it, the lid must be left open. The only thing I'm truly disappointed in is that the label, undeniably beautiful vintage collages inspired by each scent in the collection. The label seems to be a sticker or waterproof paper of some sort, wrapped around the body. I notice some ceramic candles in my haul, the label was not evenly done, with a slight protrusion which makes it unsightly. I do wish, it could just be printed onto the ceramic body one way or another to really make this exquisite. I guess that could be blessing in disguise if you'd want to repurpose them into home decoration or storage pieces by removing the labels. 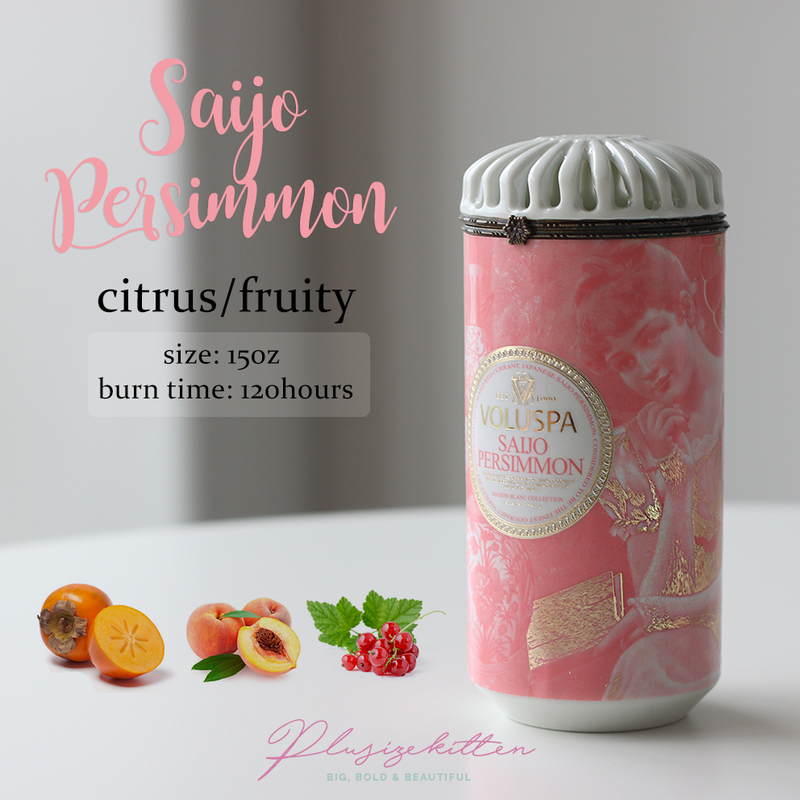 The scent - Saijo Persimmon, has notes of the finest variety of persimmon layered with peach and red currant. It made me happy because it smells of yummy juicy peaches being squashed and blended into peach tarts. It's not overly sweet but the happy cozy sweet kind. A lovely citrusy fruity scent, suitable for summer. The scent lingers for a couple of hours after burning. More information about this candle here. Check out my 3rd Voluspa haul here with more pictures of the Ceramica Alta.